A few years ago, working on a story for the Washington Post Magazine, I spent months visiting the residents of an assisted living facility in Bethesda, Maryland. At the same time, my own father’s health concerns and my mother’s recent death were making me more conscious of this task that most of us will eventually take on: caring for our aging parents. The subject was in the air, it seemed. When I ran into friends at the bank or the farmer’s market in the town where I’ve lived for 25 years, conversations that had once focused on our kids had shifted. People were talking about home health aides, about ADLs instead of SATs, geriatricians instead of pediatricians. 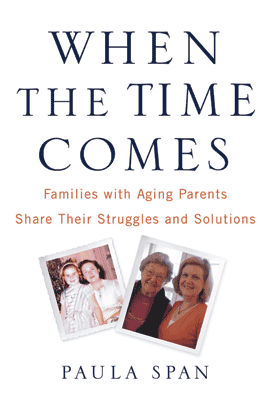 In 2006, I began work on “When the Time Comes,” an attempt to look more deeply into the ways adult children help their parents navigate old age. I wanted to tell the stories of families who’d chosen a variety of options when their parents were no longer able to live independently. With the help of friends and professionals, I found about a dozen families willing to let a reporter tag along through these stressful transitions. One daughter was keeping her mother in her little house in the Bronx by hiring home care aides; another was moving her mother into her own household in upstate New York. Two families in the Boston area were considering assisted living. Two were moving their parents into a nursing home outside Trenton. And two Baltimore families had parents who’d entered hospice care. Their experiences, which I tracked for months, form the heart of the book. “When the Time Comes” isn’t a how-to manual. I think of it more as a support group in print: We learn from one another. But I’ve included a great deal of information about aging and eldercare: interviews with researchers, experts and advocates; data and discoveries from stacks of academic studies; a resource list. I want the book to be useful. I also want it to honor the hard but vital work that families still do, as they always have, to care for the people who cared for them.